July 2015 - Perry Hood Properties, Inc. When constructing homes for our customers, we allow them to choose their own hardware. You have the choice of oil rubbed bronze or nickel for lights, plumbing fixtures, towel bars and other accents and pieces around the home. Whether you’re building a new home or just looking to update your current home, making these choices can be difficult, however. Here’s a primer to help you choose between all the various fixture finishes available. The choice of many of our home-buyers, oil rubbed bronze hardware around the home offers a traditional look and feel. It’s a great alternative to the more modern chrome or brushed nickel finishes. Oil rubbed bronze is also easy to clean, durable, doesn’t show water spots or fingerprints and is easy to match with other elements in your home. Brushed nickel is another great choice because it goes with almost everything. That’s likely why it’s been a standard choice for homes for decades. It also lasts longer than nearly any other finish so you won’t need to re-finish or change out fixtures in the foreseeable future. The only material designers recommend you don’t use with brushed nickel is stainless steel because it makes the nickel blend in rather than standing out. A close cousin to chrome finishes, this smooth, shiny finish offers a slightly darker look. It even has a tendency to change color slightly under different lighting. This can make it hard to match, however. But, it’s another easy to clean and durable option that helps you create a modern look. An old stand-by, polished brass immediately gives any room a vintage, old world feel. While it’s readily available, brass is typically more expensive than other finishes. Still, it matches well with almost anything and is quite durable. This could be the finish of the future as designers have been increasingly infatuated with it. It brings a brushed gold look without the shiny, showiness of polished brass. The matte finish also makes it more durable and means it doesn’t show water spots and fingerprints. Currently, it’s difficult to find, however, and can be quite expensive. But, it can be paired well in almost any setting. If you’re looking for a simple, inexpensive finish for your home’s fixtures, chrome is the first thought of most home builders. It’s both versatile and easy to maintain. But, while it goes with almost everything, it also requires constant cleaning. More than any other finish, every smudge and stain shows up clearly on chrome. Ready to build your own custom home with features that you love? Give us a call and start the process today! Repairs are an unfortunate reality for home owners. Even if you buy a newly constructed home, eventually repairs will be needed in some areas. Planning and budgeting for these inevitable repairs makes them much easier to deal with. At Zillow, Mary Boone put together a list of common repairs you can expect to make to your home after a few years of ownership. While some of these can be repaired yourself, others may require a professional. On average, a household garbage disposal is expected to last about 10 years. However, if a kitchen disposal is used often or isn’t cared for properly, it’s likely to last much less time before needing repairs or replacement. New units with professional installation are likely to cost a few hundred dollars, but minor repairs can likely be performed yourself. Jams or clogs are typically fairly simple fixes, but eventually a blade, impellor or motor will probably need replacement. For these more major repairs, buying a brand new unit is sometimes more cost-effective. 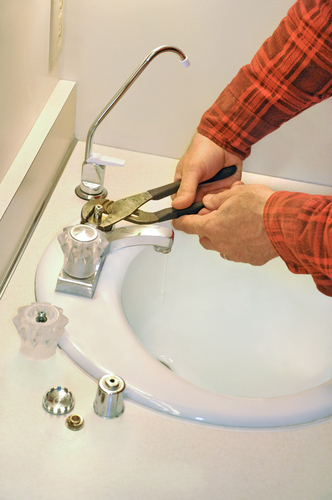 If you do decide to work on your own disposal, be sure to take proper safety precautions. Backed up sinks and clogged toilets are also part of being a homeowner, but don’t necessarily qualify as actual repairs. Plumbing problems do occur, however, and even something seemingly minor like a dripping faucet could be costing you money each month. For example, the EPA reports that leaks in an average household waste more than 10-thousand gallons of water every year. One in 10 homes have leaks that lose at least 90-gallons each day. These leaks may not even be evident without some investigating. To check your home, check your water meter, then use no water for 2-hours. Check it again and if the meter reading has changed, there’s a leak somewhere. Check your toilets by dropping a small amount of food coloring in the tank. Wait 15 to 20 minutes and see if any of that coloring has made its way into the bowl. If so, there’s a leak. When a leak is found, it usually a good idea to hire a licensed plumber to fix it and investigate the rest of your plumbing. High quality paints and siding can stand up to lots of abuse and last for years. Even the most durable paints will need touch-ups eventually, however and severe weather may accelerate that need. When paint starts to chip or crack, or siding is damaged, your home becomes more susceptible to rain, wind and insects. Sanding and painting the trim around doors and windows is a simple job for homeowners and will likely need to be done every few years. A full exterior paint job typically costs at least a couple thousand dollars, but waiting could increase costs as weather and insects do more damage. Other exterior materials on your home, like stucco or brick, also need regular inspections and repairs. If your home is constructed out of high-quality materials, like our homes at Perry Hood Properties, you’ll have the luxury of living in it for years before repairs are needed. Even so, knowing these types of repairs are likely eventually will help you properly plan for them and potentially prevent them for longer. If you’re ready for a new home in Tulsa, Bixby or Broken Arrow, browse through our currently available homes or call us to start construction on a custom home. Over the past few years, more and more home buyers have expressed interest in frameless glass shower doors. There’s no denying these doors give any bathroom a more modern and sophisticated look. That’s part of the reason why Perry Hood Properties homes have been using frameless glass shower doors in many of our newly constructed homes. Here are some other reasons we enjoy about using them. Above all else, a frameless shower door brings a stylish look to your bathroom. Not only is the crystal clear glass an amenity that suggests luxury, but your carefully decorated shower tiles also have a chance to shine. No more will you be stuck with an ugly, metal frame typical of showers for decades. This new, more minimalist approach ensures your bathroom will be stylish for years to come. A frameless shower door helps to increase the value of your home. While many who are installing frameless showers after their home is constructed may be concerned about their price, the value they add to the home helps you make up that cost when you sell. They also make your home more attractive to potential buyers. At Perry Hood Properties, we put thought into each room of our homes and install features that last, save energy and add value. 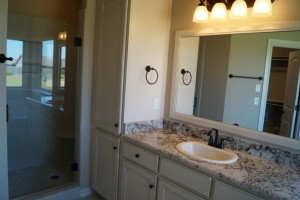 Frameless shower doors offer our home buyers a great look and a lasting value. At first glance, a frameless shower door may not appear very sturdy. Something made entirely out of glass can’t possibly stand up to much abuse. 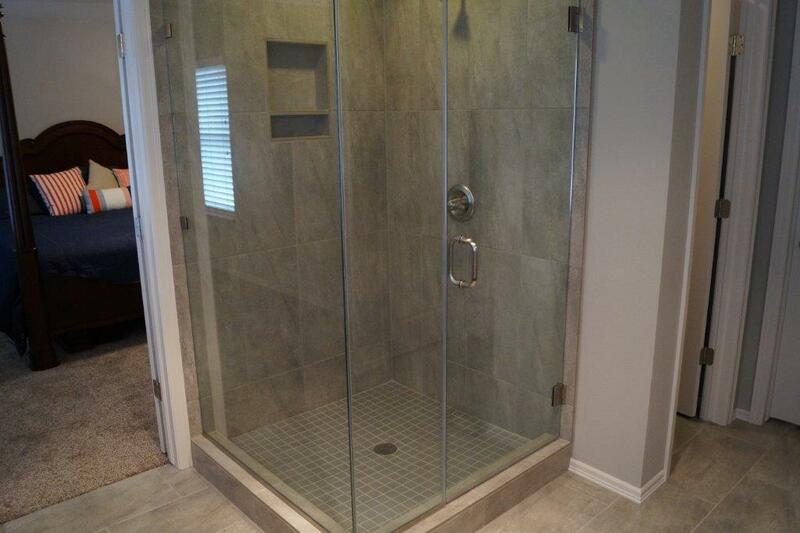 In reality, these glass shower doors are tempered to make them as durable as possible. For any predicted bumps and knocks that a shower door would typically withstand, these doors will remain flawless. Cracks and shattering are no concern in typical situations. There are very few reasons not to add frameless shower doors to your bathroom, and even less reason not to purchase a new home with this feature. 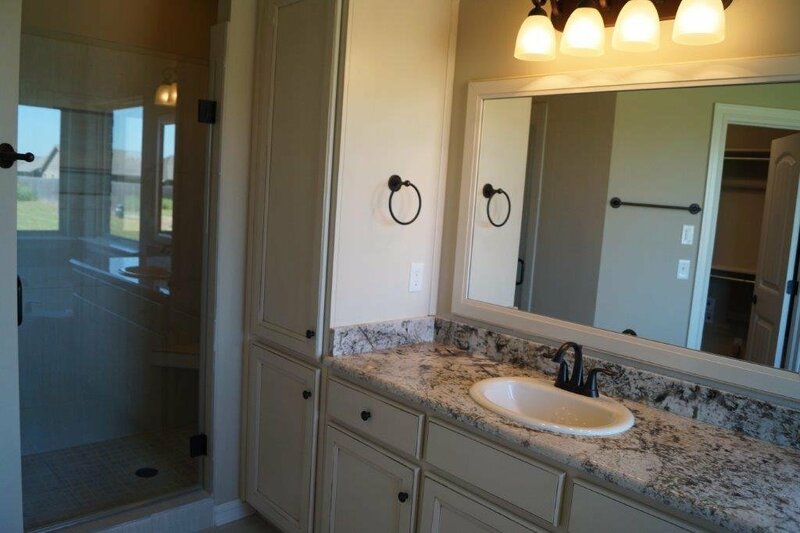 To browse through our available homes with modern bathrooms and other amenities, check our online catalog or give us a call to start building your own custom home. It can be an eye opening experience to move out of a home you’ve lived in for years, or even replacing furniture in your home after years in the same spot. It’s often at times like this that you first notice just how faded parts of your furniture or carpet truly are. The damage done to furniture and flooring is due to the sun’s UV rays. Just like your skin being damaged by the same rays, items in your home are vulnerable. Thankfully, there are a few different options for maintaining your home and your furniture. If you want to avoid getting a sunburn, you would apply sunscreen or sit in the shade, right? There are similar tactics for your furniture. To avoid fading in your home, close the blinds or curtains. That makes your home dark and dreary, however. Another option that doesn’t shut out natural light is to install new windows. Laminated windows or low-E coated coated glass, which is featured in many Perry Hood Properties homes, can block as much as 99-percent of harmful rays without blocking out light. Not only does this protect your furniture, but it also protects your family’s skin. Major fading problems occur on your home’s rugs when they stay in the same spot day after day. Sun from your windows will hit a rug in the same place and eventually fade those spots. But, if you periodically rearrange your room and rotate your rugs, fading can be minimized. Or, at least, fading will be more even, which makes it less noticeable. Spray-on fade protection is also available, but many question how effective those really are. Wood floors are susceptible to fading from the sun just like furniture and carpet. Often, this leads to costly repairs also. Oddly, some wood will turn darker when exposed to large amounts of sun, while others will lighten. For natural wood, your best options are either protecting the floors from UV ray exposure, or using rugs and furniture to lessen the amount of direct sunlight on your floors. Again, by periodically rearranging your furniture, you can provide some protection and keep obvious faded spots from forming. The key to protecting your furniture from the sun starts when you purchase it. Lighter fabrics tend to show less fading and are a good option for rooms that get a lot of direct sunlight. The same goes for many leather finishes. When buying a new piece of furniture, be sure to ask about colorfastness to avoid any surprises. If a piece of furniture is expected to fade, consider moving it to a room with less sun exposure. 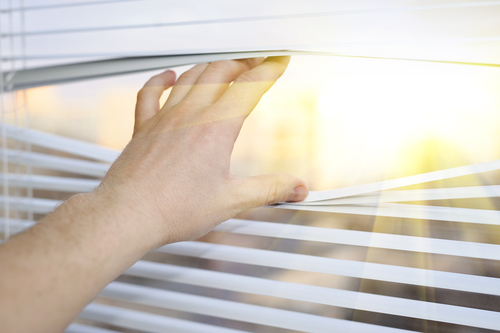 When protecting your items from sun damage, your choice is to keep them out of the sun completely or to invest in windows that help keep out UV rays. At Perry Hood Properties, we believe Low-E windows are a great investment for the home. Not only do they filter out UV rays, but they also help to lower energy costs. Browse through our currently available homes to see more of our features or call us to start construction on your dream home.